'David Bevington and Eric Rasmussen have revolutionized the study of Marlowe's brilliant and in many ways baffling play, and this excellent edition digests two decades of complex research into a clear and readable form. Teachers and students of Elizabethan drama will find this an invaluable resource.' Professor Stephen Orgel, Stanford University 'A landmark of world drama, Dr Faustus remains one of the foundational plays of the English Renaissance. In this thoughtfully annotated, revised edition, Bevington and Rasmussen present both of its early versions in parallel format. This is a text for students and scholars alike, as its learning gracefully clarifies Marlowe's achievement.' Douglas Bruster, University of Texas at Austin -- . Dr. Faustus is one of the jewels of early modern English drama, and is still widely performed today. Interestingly, the play has come down to the contemporary audience in two distinct versions that have become known as the 'A' and the 'B' texts. David Bevington and Eric Rasmussen, who edited the original Revels edition over twenty years ago (and are two of the most eminent editors currently working), have hit upon the fascinating idea of presenting both texts on facing pages. This allows readers to compare the two 'versions', the 'A' text which is the one closest to Marlowe, and the longer 'B' text with additions by Samuel Rowley; in this unique edition, the reader is made aware of the changing tastes of audiences, the stage history of the play, and of just how intricate 'editing' a play can be. 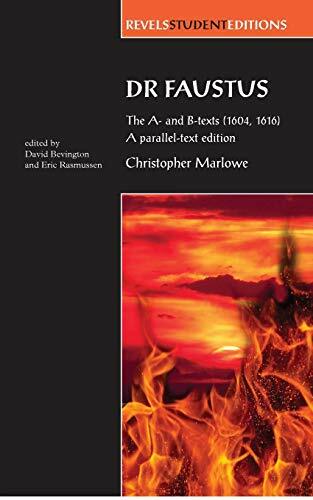 With a concise and illuminating introduction, and relevant notes and images, this Revels Student Edition of the 'A' and 'B' texts of Dr. Faustus will prove to be an enthralling document, and an excellent edition for student and theatre-goer alike. -- .